Not So Golden Slumbers? Learn How Your Dentist Can Help! SRBDs are characterized by recurrent episodes of a reduced amount or even cessation of respiratory airflow (i.e. breathing) during sleep. 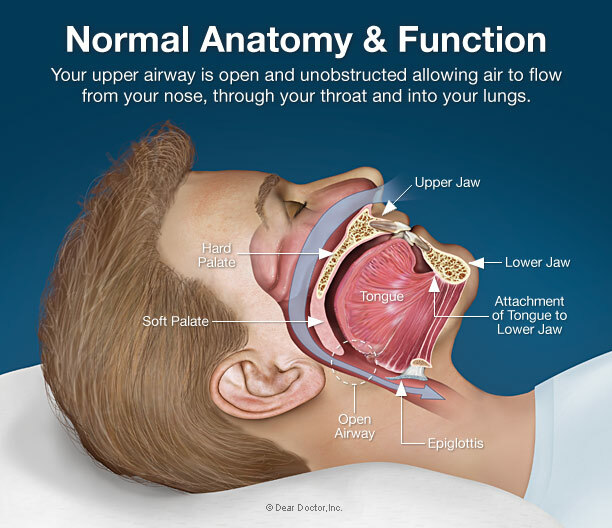 This is caused by collapse of tissues in the back of the throat, at the levels of the upper airway or windpipe. While intermittent and shallow snoring is less likely to be associated with medical complications, as time and snoring progress in frequency and volume, associated medical and psychosocial problems can certainly develop. There are also multiple cardiovascular (“cardio” – heart; “vascular” – blood vessel), metabolic (bodily functions), and brain damage complications that may occur as a result of untreated SRBD — thus we must recognize that this is not a trivial issue. There are many signs and symptoms of SRBD with the most obvious being the loud and frequent snoring or lapses in breathing. However, it also includes any associated daytime sleepiness and sense of poor restfulness even with adequate time spent sleeping. An example includes the excessively sleepy individual who takes naps daily, drinks massive amounts of coffee and energy drinks, and despite 7 to 8 hours of sleep at night continues to experience excessive drowsiness and a lack of energy. In general, all sleep apnea is not obstructive in nature. For instance, some patients suffer from an uncommon type called “central sleep apnea” in which they experience breathing difficulties during sleep due to lack of appropriate brain stimuli — which control breathing activity. 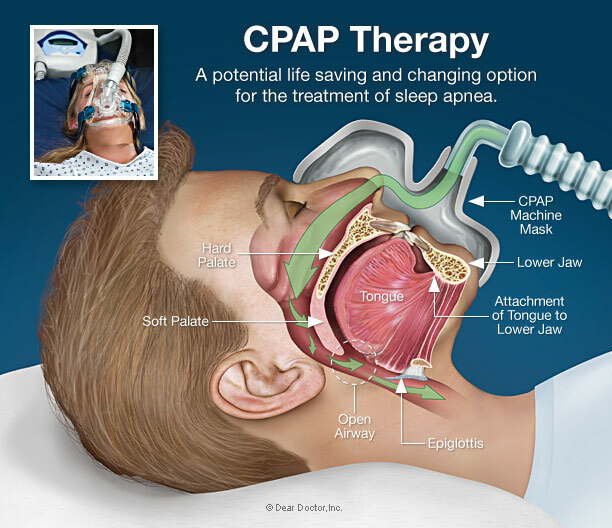 Sufferers frequently have significant brain damage and require an extensive, careful work up and management along with the use of breathing equipment called Continuous Positive Airway Pressure or CPAP for short. 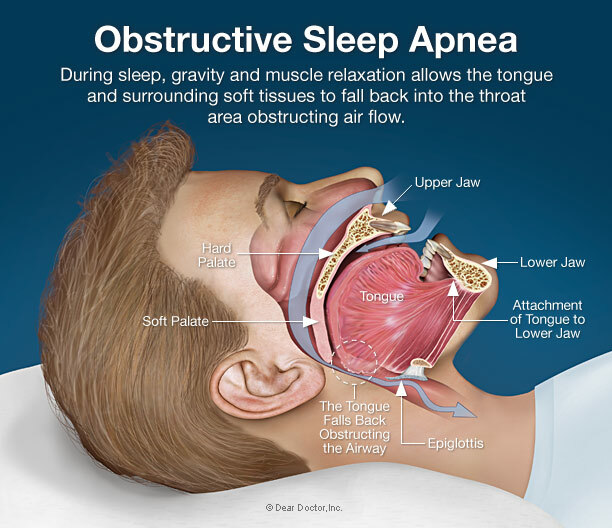 There are also mixed apnea patients who have both obstructive and central apnea events during their sleep cycle. The diagnosis of sleep apnea may be estimated by taking a thorough sleep and medical history; however, it requires objective testing during sleep to confirm and quantify. While the current gold standard for testing is an overnight, observed, laboratory sleep study in a sleep lab called a Polysomnogram (PSG), the trend towards more cost-effective and readily available testing has stimulated growth of home sleep testing. Dentists are in a unique position to provide limited medical therapy for patients with SRDB conditions for many reasons. However, there are two main avenues dentists may take in helping to address this enormous health burden. One approach is to screen and refer suspect patients to their physician for diagnosis and treatment. The second method is to co-treat the condition with the patient's physician using Oral Appliance Therapy (OAT), oral surgical procedures, or possibly orthodontic approaches. These dental approaches address increasing the volume of the upper airway primarily by bringing the tongue forward away from the throat. There is a great deal of scientific evidence supporting both the OAT and surgical, hard tissue approaches; thus, dentists should actively seek training to reach competency so they can offer these treatment options to their patients. OAT has been shown to be slightly less effective than CPAP therapy, but cross over trials comparing both treatments have validated significant patient preference and increased long-term use by patients using OAT. Sleep related breathing disorders affect general health in a most fundamental way; there is nothing like a good night's sleep and the feeling of awakening refreshed, re-energized and invigorated — ready to face a new day. Because dentists see patients on a regular maintenance schedule during wellness dental and dental hygiene care, they are in a unique position to identify early SRBDs. 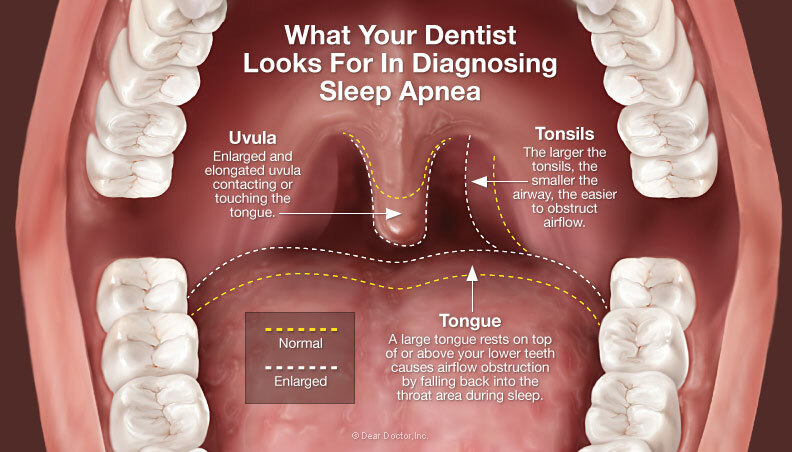 They may also identify sleep disorders by observing “snorers in dental chair” where patients fall asleep within a short time at dental appointments. Dentists are familiar with the mouth, oral cavity and parts of the upper airway and can easily learn to screen components of the airway with little additional training. SRBD is a societal epidemic with far reaching consequences both medically and psychosocially as well as carrying an enormous economic burden. Properly trained dentists have been acknowledged by the American Academy of Sleep Medicine (AASM), as being able to provide first line therapy for the treatment of mild to moderate sleep apnea. Only dentists are able to fabricate, fit, adjust, monitor, and treat complications associated with Oral Appliance Therapy, used in managing SRBD. Having a problem sleeping or snoring, tell your dentist. Have you had success treating sleep disorders and how long have you been making oral appliances for sleep disorders? If you do not treat sleep disorders, can you refer me to someone you know who is an expert in this area? My bed-partner is constantly snoring and often stops breathing during the night. He says he won't wear the CPAP machine during the night. 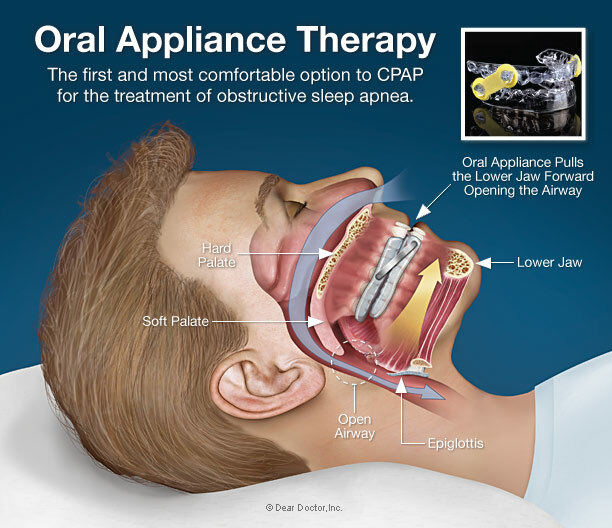 How effective is oral appliance therapy? I cannot wear my CPAP machine and often take the mask off in my sleep, what are my options?